"Facilitation is not easy!" "I have gained more insight about the why of participatory rural appraisal methods", "I discovered more about my own facilitation style". Two ICCO - Togetthere Junior Capacity Development advisors participated on the 27th January 2010 in the training Facilitation of PRA. They will be active as facilitators in Honduras and Indonesia. The training was focused on practising, reflection and getting feedback. As case study was choosen a video about Farmer to Farmer learning in Ethiopia. A Red Cross project on how to deal with climate change in Ethiopia. Exercises were done on social mapping and the historical time calender. These are methods which are regularly used for community and organisational development processes. More about PRA literature, Training manual PRA - Simon Adebo & PRA, Bishnu B. Bhandari. 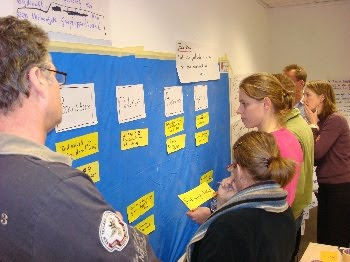 Literature and links on facilitation can be found at "Facilitation - Just another weblog". "The training helped to get focus about my future job! ", "The cases were very interesting", "The course had a good flow! We remained active and involved". "When the day started I regained my energy and got involved! ". "It had a good balance between theory and practicals!" On the 14th, 15th and 18th January 2010 the Hendrik Kraemer Institute organised a training on Project Cycle Management (PCM) and Capacity Development. 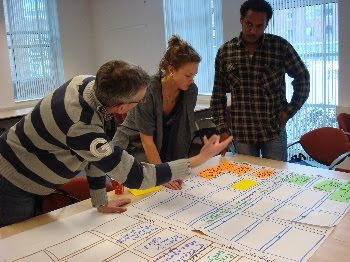 The course was attended by participants from Togetthere, ICCO, Theatre Embassy, De Verre Naasten, GZB,Mensen met een Missie and the Hivos Knowledge programme. "The practical exercises were very useful", "Wow, we had a lot of exercises and received feedback", "we learned a structure on how to do facilitation", "the role plays about resistance were very challenging".